I'm still playing catch up since coming back from my trip. Sorry for the delay. I had an amazing time in San Francisco. I spent 5 days there. I flew in on a Wednesday and flew back home on a Monday. I went with my friend who invited me to run the race Bay To Breakers. We had been running and working out together and this was an opportunity I just couldn't pass up. I found a sitter to watch my boys on my husbands work days and local family helped out on the weekend with meals and helping keep the boys occupied so my husband could get a little bit of a break. I haven't felt this alive (other than giving birth to my sons) since my husband and I went to the Seattle area pre kids. I must say that this trip was a definite reality check for me. There is so much out there to experience outside of diapers, cleaning the house and laundry. This trip has gotten me to think about what I want for my future outside of being a mom and wife and I want to share more of that with my husband. I want to prioritize the relationships that are important and very valuable to me in addition to setting goals for myself. I feel like I am destined to do more but what that 'more' is I haven't figured out yet. 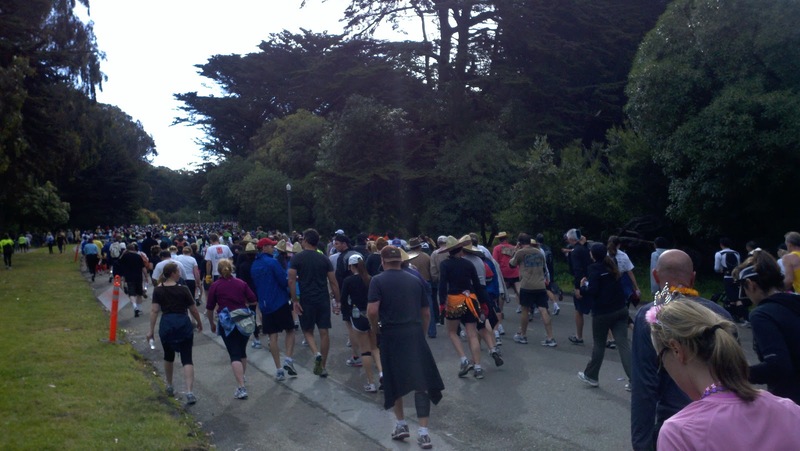 55,000 people registered to run. All ages, shapes and sizes. 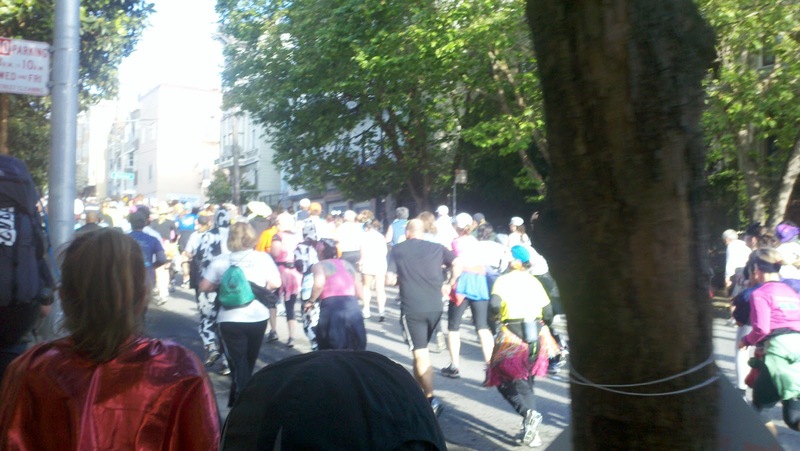 We took a cab to get to the race and with the traffic we needed to bail out of the cab and run to the starting line. Flour tortillas were being tossed in the air along with beach balls as we were waiting in our coral to start the race. The DJ was playing "Eye of The Tiger". In case you don't already know many people wore some very creative costumes including their very own birthday suit (yes when I say birthday suit I really do mean naked). 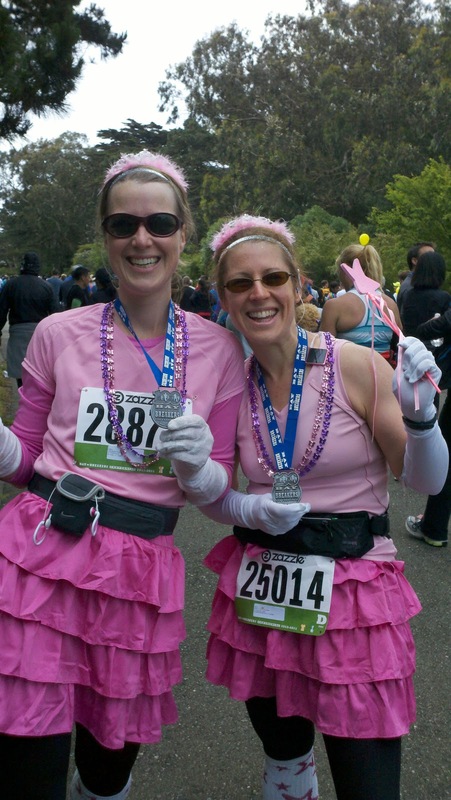 My running partner and I elected to wear pink princess costumes. The finish line was at the ocean. On our way through Golden Gate Park we saw bison and a waterfall. Ran it in a little over 1 hour and 20mins which wasn't bad considering how crowded it was and the fact that we were corralled in a group that was a slower pace than we could run. Intervals of run 5 walk 1. Recap: ran to the starting line (about half a mile), ran 7.5 miles, took a bus .5 miles then walked 7 miles. 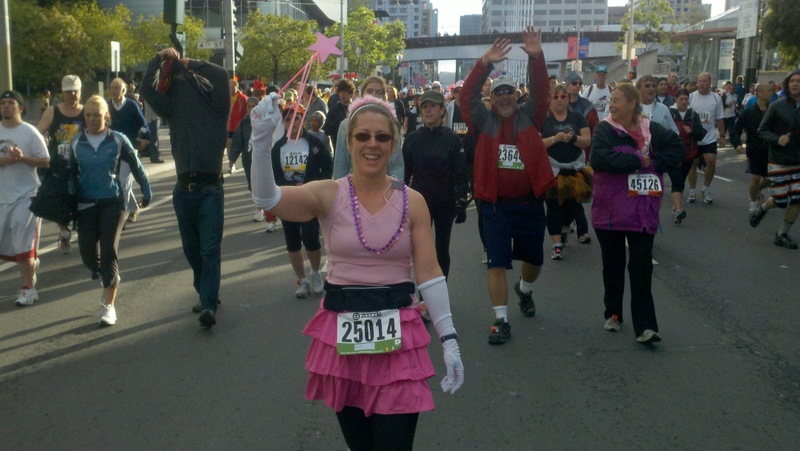 Nothing hurt :-) Perhaps a half marathon is possible? Would I do this race again? - You bet! Had an amazing time and the energy from the crowd was awesome! Having a little fun at the expo a few days before the race. 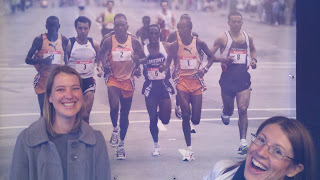 If only I could run as fast as those in the picture behind me. This was at the beginning of the race during my first walk break. I had Gwen take my pic. I took a picture of Hayes street hill during my 1 min walk break. Post race heading back into the park to the footstock. Lots of people! we picked up our medals. Thank you for reading and posting your comment. The 7.5 miles seemed easy as I was not running it alone. The medals were what everyone received who crossed the finish line....and an achievement it was!